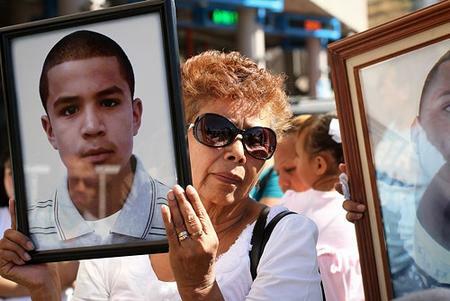 Taide Elena with portrait of grandson slain by Border Patrol, Nogales, Sonora. Credit: Josh Morgan, Tucson Weekly. On April 10, 2013, hundreds of people gathered on both sides of the U.S.-Mexico boundary, uniting at the wall which divides Nogales, Sonora and Nogales, Arizona. 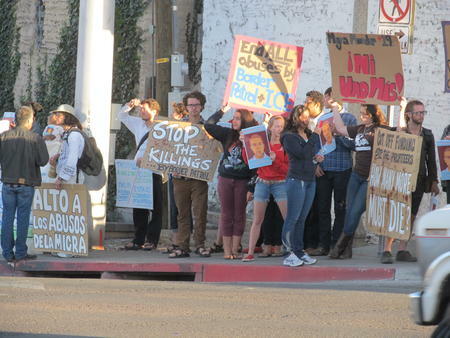 The occasion was a binational vigil and protest on the six-month anniversary of the killing of 16-year-old José Antonio Elena Rodriguez, gunned down by the U.S. Border Patrol on October 10, 2012. 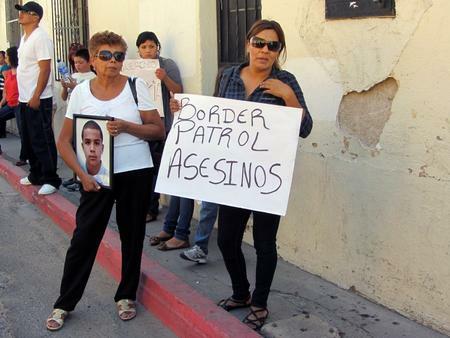 We protested six months without justice: six months without even knowing the names of the agent(s) who shot José Antonio from the U.S. side of the divide; six months with no charges filed against anyone in the Border Patrol by U.S. authorities; six months of grief and frustration. But there had also been six months of struggle; six months of organizing; six months of not letting people forget. So there many of us stood on April 10, at the very spot where José Antonio died, the second large mobilization at the border wall since his death. April 10, Nogales. Credit: Richard Boren. Before arriving in Nogales, I decided to make a video about the action. I usually don’t make such a decision until I attend an action and have answers to various questions: Are there enough people present? Is the event well organized? Is it sufficiently inspiring? In this case, there were more than enough reasons to produce a video (see below). Yet, if I had to choose one I would put forth the name of Taide Elena, José Antonio’s grandmother—the grandmother who is pushing back against the wall of secrecy and the veil of impunity which hangs over these tragedies. Taide Elena is the mother of José Antonio’s father, who passed away several years ago, so she stepped in to help her daughter-in-law fill the void in raising José Antonio. She has stated how loving a child José Antonio was and how profoundly she misses him. Taide Elena’s grief is painfully apparent, but it is also apparent how her iron will for justice and her remarkable courage have transcended that grief. It is clear she will not rest until there is justice for her grandson and for others who have tragically died along the border. Taide Elena and Araceli Rodriguez, mother of José Antonio. Credit: Nogales International.The border can often seem like a sort of free-fire zone for the Border Patrol. Those who are gunned down, often shot in the back—as was José Antonio several times—are collateral damage. They are effectively part of the price of securing the border against supposed threats to national security. Taide Elena and those who rallied together last month know that U.S. border policing strategy has itself become a grave threat: a threat to the rule of law; a threat to democracy; a threat to the very survival of many who live in the borderlands. Taide Elena represents the very best of the border, where people are rising up and joining the struggle for justice, for peace, and for friendship between neighbors divided by a hideous border wall. Due to the efforts of Taide and others the tide is slowly beginning to turn on the border. In this moment of terrible darkness, a beam of light is shining and the darkness no longer seems so vast. Richard Boren is a free-lance journalist and activist based in the Arizona-Sonora borderlands. He blogs at The Hobo Dispatch.